The Kyrgyz public has reacted with surprise to the idea of renaming their capital after a mythical national hero. Politician Emilbek Kaptagayev wants the city of Bishkek to be known as Manas, a warrior whose adventures make up a massive epic poem dated back to at least the 18th century. The former presidential chief of staff posted on Facebook that this would prevent "any temptations that might emerge after the passage of the years" to rename the capital after potentially-divisive politicians. The impetus for this was the decision of neighbouring Kazakhstan to change the name of its capital city from Astana to Nur-Sultan, in honour of Nursultan Nazarbayev, the country's first president who stepped down last week after nearly 30 years at the helm. Reaction ranges from exasperation to wry humour, although the proposal does muster some support. "The people are mired in poverty, while these idiots want to change the names of capital cities," one angry commentator wrote under the Facebook post. Mr Kaptagayev comes in for some personal criticism too. "I can see why no-one will give him an official job anymore," writes one sceptic on the Vesti.kg news site. "Do something to develop the city first, then call it what you like. Call it Kaptagayev if you want to," says another. Alternatively, some called on the politician to change his own name to Manas, or even Bishkek. Politicians soon piled in, largely to dismiss the proposal as trivial. "We'd be better off raising our economic development to Kazakh levels first, before copying this name-changing," city councillor Rysbay Amatov told Maral FM radio. Maksat Chakiyev, a former deputy tourism minister, told Maral that he wants to take the Kazakh example a step further and build a whole new capital called Manas, rather than spend large sums every year on trying to improve the Bishkek infrastructure. And Bishkek could stay the financial centre, just as it was done in Kazakhstan when its capital was moved from Almaty in 1998, agreed another commentator on Radio Azattyk - Radio Liberty's Kyrgyz service. Mr Kaptagayev doesn't want Bishkek to disappear entirely. Instead, he suggests giving the name to the city's current Sverdlov district, which is named after a lieutenant of Lenin's who had no connection with Kyrgyzstan. But the Manas partisan can't avoid a swipe at Bishkek Baatyr, a rival figure of legend who allegedly united the ancient Kyrgyz tribes. "There's not a single historically reliable source about Bishkek Baatyr, just legends that get mysteriously overgrown with ever more new details each year," he writes on Facebook. Dismissing the story of Bishkek Baatyr while defending that of Manas was always going to be a risky tactic. "Why do we have to name everything after Manas? 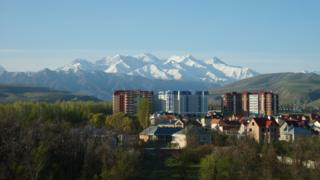 What's wrong with Bishkek? It's a good Kyrgyz name. You say we only know about Bishkek Baatyr from legend, but the same goes for Manas," complains one commentator, making the point that Bishkek airport and university are already named after the legendary hero. Another tells Mr Kaptagayev that Bishkek will always remain Bishkek. "Build your own city, then call it Manas if you like," he writes. This also prompted some commentators to back reverting to the name the city bore throughout the Soviet period - Frunze, after the military leader who conquered the Kyrgyz lands for the Bolsheviks. "Mikhail Frunze may have been a Red commander, but at least he was a real person who doesn't get 'overgrown with details'," one supporter wrote to Radio Azattyk.